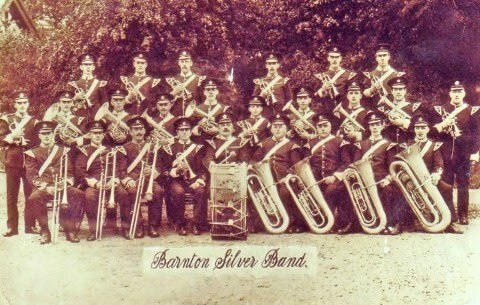 Barnton Silver Band was first formed in 1891 under the name of "Barnton Temperance Band". The first practice was held on Thursday September 3rd 1891. The first practice rooms were an old hay loft and shoemakers shop at the residence of Mr Edward Hindley. The name was soon changed to "Barnton Subscription Band" to allow a broader membership after a few months and then to our final name. In 1894 a wooden bandroom was built in Oakwood Lane, Barnton and the latest instruments were purchased following a loan of instruments from the original Brunner Mond & Company. We continue to play at the BM&Co remembrance service in November at Winnington. In around 1910 the band was photographed (see below) and this superb picture has been sent to us by Paul Latham. We have traced 'Philip Fogg', a cornet player, on the front row 4th from the left. He is Paul's Great Grandfather. In The Great War, the band contributed 15 men to the forces, of these 12 joined up in 1914. All these came back, one lost a leg and the use of his right arm, another lost the use of his right arm, another lost the use of his left arm and another died later of disease contracted during the war in Greece. One member was awarded the DCM and the Italian Medal for Valour. In the early part of the war the band paraded at Winnington, Barnton, Anderton, Comberbach & Antrobus for funds for soldiers comforts. The band continued to be very active in the local community. For example on August 27th 1921 the band lead a procession to open the new Comberbach War Memorial and Recreation Field to the strains of "Onward Christian Soldiers". This was thought to be in 1922 but Comberbach Bowling Club records have shown otherwise. There were free teas for the children and also for those who had lost someone in the war. This was our first recorded job. Mrs Jean Foster has provided some of the later history. During the 1940s the Leicester family dominated the band personnel. It was suggested if there was a call, 'Leicesters fall out', there would be no one left in the band! The 1990s were a purple patch for the band with Peter Hormbrey on tuba, son Edwin on cornet and great friend and star soloist Howard Bancroft also on cornet. Edwin excelled with his music and at one time a surfeit of cornet players in the band forced him to switch to the trombone. An adjustment he took in his stride as he went on to greater things with the Dalton Band and The Cheshire Youth Band. Howard not only starred in the band, but was also a gifted glass blower at ICI. Two of the trophies from the Finals of the North West Region at Blackpool in 1994 and 1995 now adorn the mantelpiece at the Hormbrey home, The Poplars, together with some of Howard's impressive glass work. Over the last 19 years we have taken part in brass band contests in the 4th Section and reached the dizzy heights of the third section for a while under the baton of Steve Yates. After falling on hard times about 5 years ago, the band not only survived but after acquiring a new conductor, Brian Lamb, started to recover again. We returned to contesting in the 4th Section and are now very active again in the local community. We'd love to hear of any more history from band members, relatives etc so please email us !